Some of you may know that I am a rep for the fabulous company, Happy Piranha! And I figured I’d do a little feature post to tell you a bit more about them, and show you some of their amazing products – there’s even a special discount code for you all at the end! Happy Piranha are an online company based in the UK, who specialise in themed candles. They have a HUGE selection ranging from book inspired scents, through to game themed scents for all you gamers out there! Not only to they smell incredible, but they also have some of the most gorgeous label designs that I have ever seen on a candle. Like, EVER. “The Greatest Show On Earth” – Caraval and The Night Circus inspired candle, this smells of Toffee Apples. It’s a very sweet, indulgent scent, perfect if you love sweet scents, but smells even better when burning! “Polyjuice Potion” – one of several Harry Potter themed candles, this one reminds me of marzipan, another sweet scent and one of the most incredibly detailed packaging designs. This one smells great burning, but I sometimes like to just leave it sat in a room with the lid off… My room smells amazing! “Wing Leader” – inspired by Manon Blackbeak from the Throne of Glass series, this is my ultimate favourite candle of any candle to ever exist. It smells so fresh, and has a gorgeous pink colour! “Courage (Gryffindor)” – one of four Hogwarts House scents, this one smells divine. A warm, woodsy scent with a hint of sweet cinnamon, this is the perfect smell for the Autumn season, and any Gryffindor! Happy Piranha have also just launched a range of tealight sets! The packaging for these sets are super cute, perfect for gifts leading up to Christmas, and to make it even better, each tea light in the box has a different scent! I can’t wait for my package to arrive so I finally get to try these out! 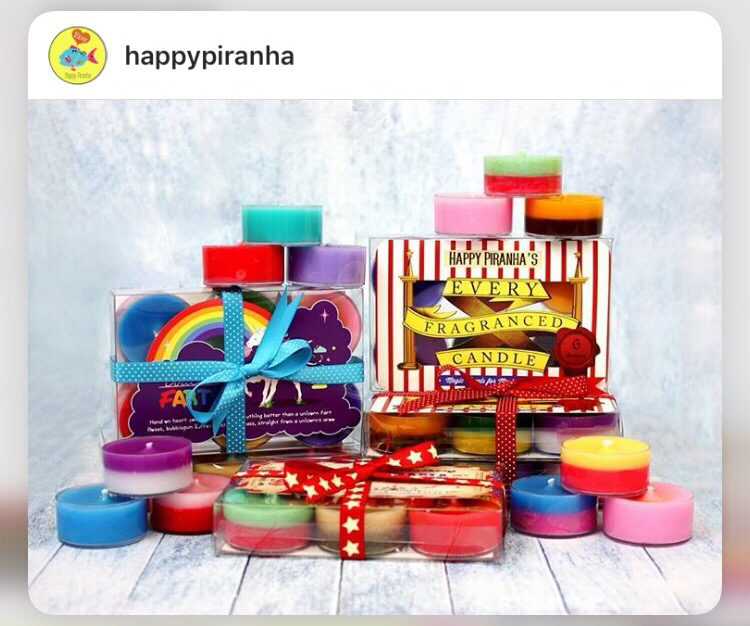 Make sure you all go and check out HappyPiranha.com – all of the candles are very reasonably priced for the incredible quality of the products, but you can also get a 10% discount by entering the code INCASEOFPIRANHA at the checkout. Go and make those Piranha’s extra happy!